Batteries and capacitors have similar charging requirements, which are well fit by Magna-Power Electronics power supplies standard feature-set. When connected to a battery or capacitor, the Magna-Power Electronics supply is programmed for the nominal open-circuit voltage, and the maximum desired charging current (rate of charge). The power supply operates in constant-current mode, charging the battery or capacitor at the defined charging current, while the voltage rises with amount of charge. Once the programmed nominal voltage is reached, the Magna-Power Electronics power supply automatically crosses over to voltage-mode control and the charging current drops to zero, as charging is complete. The requirement for a blocking diode between the Magna-Power Electronics power supply and the batteries or capacitors depends on the application. The power supply output consists of a large bank of capacitors used to filter output ripple and bleeder resistors to discharge the capacitors when the power supply is not in use. A blocking diode is commonly required to protect these output capacitors, as connecting the power supply to a charged energy storage device will cause a back-emf that could potentially damage the output stage. In addition, the blocking diode prevents discharge of the energy storage device across the output bleeder resistance. While blocking diodes are not provided by Magna-Power Electronics, our sales engineers can help define suitable diodes for a variety of different applications. In some applications, a blocking diode may not be required. With the high slew rate option (+HS), standard electrolytic capacitors are exchanged for lower capacitance film capacitors. These capacitors can tolerate the back-emf produced by an energy storage device, as long as the nominal open-circuit voltage is within power supply's maximum output voltage rating. With the high slew rate option, the power supply will still have output bleeder resistance, which will result in a slow discharge if the energy storage device is not disconnected when fully charged. Without the high slew rate option, a blocking diode can be avoided by precharging the power supply to the energy storage device's nominal voltage, to minimize the amount of back-emf. 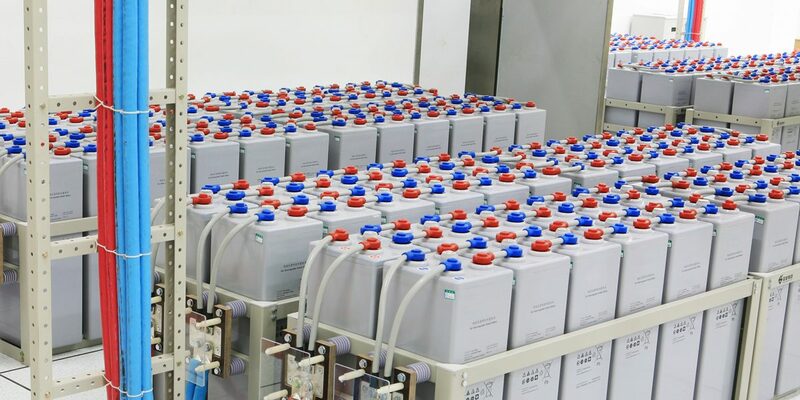 Precharge is accomplished under open-circuit conditions by programming the power supply to the energy storage device's nominal voltage and maximum charging current, then enabling the output before connecting the energy storage device. The energy storage device is then connected to the power supply output using an appropriately rated switch. Voltage transients onto the energy storage device should be closely monitored to ensure they are not exceed the energy storage device's rated values. Remote sensing, available on models up through 1000 Vdc, allows the power supply compensate for a voltage drop between the power supply output terminals and the load. As standard, the power supply will sense voltages directly at the output terminals. With remote sense enabled, however, the power supply will sense from connected sense leads, allowing it to compensate up to 3% of its rating. Use of remote sense for battery and capacitor charging is common, as it allows compensation for the blocking diode voltage drop. In addition, with remote sense enabled and the sense leads attached, the power supply display and remote programming will feed back voltage measured at the remote sense location. Care should be taken when using remote sense functionality. Magna-Power Electronics power supplies feature smart detection when remote sense is enabled and sense leads are not connected, as indicated by a blinking remote sense LED on the front panel display; under this condition, the power supply automatically reverts back to local sensing. However, switching remote sense leads or disconnecting the sense leads while the output is enabled will put the power supply in momentary open-loop conditions, without proper feedback, producing undesirable operating conditions. If switching remote sense leads is an application requirement, the power supply must be in standby when this switching occurs. Current-fed power processing technology: Magna-Power Electronics signature power processing topology enables its power supplies to operate under even the most abusive load conditions. For capacitor charging, the power supplies are able to turn on into and regulate short-circuit load conditions. High accuracy programming: The newest generation of Magna-Power Electronics products offer among the highest programming and read-back accuracy on the programmable power supply market. The high precision offered by the products means less equipment necessary for data collection and measurement and closer programming to nominal voltages of energy stroage devices. Low voltage ripple: Charging voltage and current ripple plays major role in service life of battery systems. All of Magna-Power Electronics power supplies offer extremely low voltage ripple, as low as 0.03% of rated voltage. Remote voltage sense: Magna-Power Electronics power supply models up through 1000 Vdc feature remote sense capability, allowing compensation for voltage drop across blocking diodes and output cables. While battery charging requires only single-quandrant operation, cycling batteries requires two-quadrant operation to sink energy from batteries. Utilizing an independent power supply and load to provide each quadrant of operation provides maximum system modularity. In addition, separating the power supply and load enables the use low-cost passive resistive load banks for discharging. Alternatively, an electronic load can be used for increased progammability of loading characteristics. Fluid transitions through sourcing and sinking energy can be achieved by sizing the power supply at twice the load's power rating. The load will constantly be running at its rated power, however, as soon as the supply is turned off, the batteries will have a smooth transition from charge to discharge. Charge profiles can be programmamed in a Magna-Power Electronics power supplies through a variety of programming interfaces. 100 memory steps are available the D-Version front panel, allowing voltage and current settings to be sequenced over time. 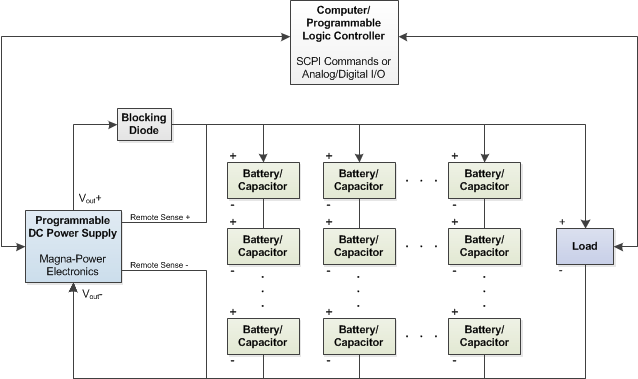 SCPI commands are supported for custom software to fully control of the power supply. In addition, provided LabVIEW drivers enables integration with other test and measurement equipment, including an electronic load. For capacitors providing high frequency pulsing, the load will appear the power supply as the average of those pulses, given that the capacitance sourcing the pulses are sized appropriately for the load. The power supply should be considered a black box and filter capacitance internal to the power supply should not be used in calculation of energy to source the pulses. The power supply will operate in constant current mode while charging the load capacitors and automatically switch to constant voltage mode when the capacitance is fully charged. If the load capacitors are pulsed continuously, the power supply will always operate in constant current mode. All Magna-Power Electronics power supplies are rated for continuous operation under peak loading conditions.